Replica Hasse graphics. Manufactured from quality vinyl and sized to suit.Other sizes and colours av.. 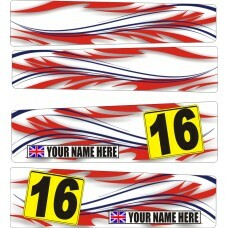 Replica Jenson Button kart graphics. Manufactured from quality vinyl and sized to suit.Other sizes a..
Personalised side pod graphic kit. Manufactured from quality vinyl and sized to suit.Other sizes and.. Replica Tonykart graphics. Manufactured from quality vinyl and sized to suit.Other sizes and colours..